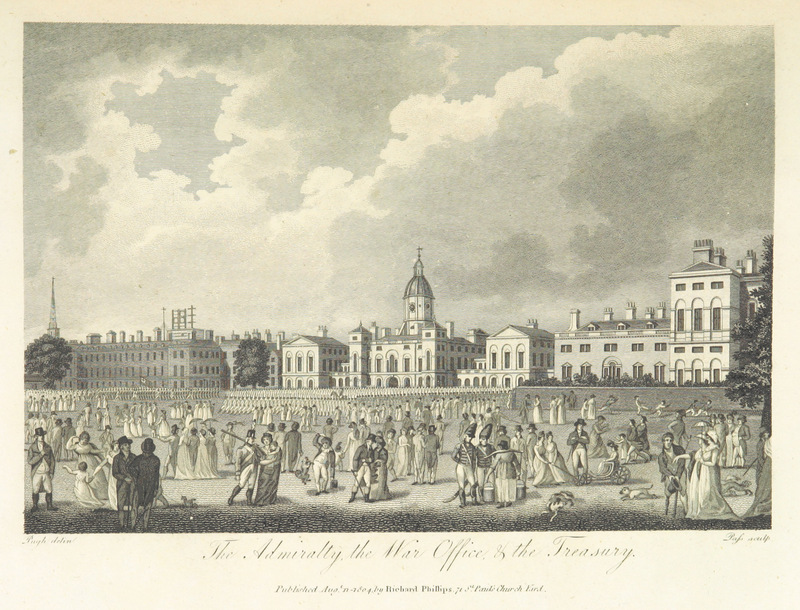 THE HORSE GUARDS, OR WAR-OFFICE, AND PARADE OF THE FOOT GUARDS. THE building in the centre represents the War-office, or Horse-guards, so called from being the station where that part of his Majesty's troops usually do duty. It was erected after a design by Vardy, and cost above 30,000l. The next, on the right of the Plate, is Lord Melbourne's town residence; it was built (under the direction of Holland) for the Duke of York, who exchanged it with the present possessor for a house in Piccadilly, upon the site and gardens of which a very extensive range of buildings called Albany-place has since been erected. The building at the extremity of the Plate on the right is The Treasury; at the west end of which, enclosed with a wall, are the gardens of the house, occupied by the Chancellor of the Exchequer. All these are of stone, and produce a fine effect; which however is lessened by the buildings, seen on the left of the Plate, being of brick. The building on the left is The Admiralty, and the house adjoining to the right, the residence of the First Lord of the Admiralty. On the top of the former are the Telegraphs, which communicate with the coast. At the extremity of the left, in the background, is the tower with the spire of St. Martin's church, near Charing-cross. The ground in front is the Parade of the Foot-guards, and a detachment is represented as marching to the palace to relieve the King's guard, which is done every morning after parade: it is very spacious, is laid with gravel, and is excellently adapted to the purpose. On the north side of the Parade is placed a fine Turkish piece of ordnance of uncommon length, brought by our troops from Alexandria; it is mounted on a carriage of English workmanship, ornamented with very elegant and appropriate devices. The coup d'oeil of the public buildings on this spot is one of the finest about the metropolis. It contains in one view the three principal offices connected with the government of the country; The Treasury on the right, The War-office in the centre, and The Admiralty on the left.